One of the most dastardly wrestlers in the business, the Specialist is known for dishing out punishment. Managed by Mayor Mystery, the Specialist is a founding member of the Parts Unknown Posse. 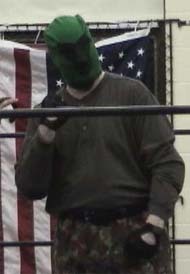 Along with team member Lord Zoltan, the Specialist aims to prove that Parts Unknown is the superior wrestling town.